How to convert video on Windows 10? A number of occasions arise where you need to convert one type of video to another. Such situations may occur if you made a video in one different format but want it to be in a different format so that you can play them on various devices. Another reason might be that you do not have a specific video player and the format in which your video is, it is not supported by the video player. These and on many other similar occasions, you need to convert videos. In this page, you will get the best video converter for Windows 10. So now that we know that it is very essential in today’s digital era to have the convenience of easily converting videos from one format to another, the problem then arises as to what the solution exactly is. iSkysoft Video Converter Ultimate is the answer to all your video related problems. This program let you convert videos on Windows 10 as easily as you can imagine. It is much more than just a simple converter. Let us see what other amazing features does this piece of program has to offer. Convert Videos in a Variety of Formats: Convert video into almost any format such as WMV, MP4, MOV, MKV, AVI and much more. You can convert HD videos as well. Extract Audio Files from Videos: Extract audio files from videos as MP3, WAV, WMA, M4A, AAC, AIFF, AC3, etc. Convert Online Videos: Download videos from 1,000+ video sharing websites such as YouTube, Dailymotion, Vimeo etc. and convert them as well. Burn Videos to DVD: It helps burn your videos to a blank DVD. Edit Videos: If necessary, you can edit your videos with built-in video editor before converting them. Fully compatibility: Works on Windows 10/8/7/XP/Vista, Mac Mojave and eariler. How to Convert Video for Windows 10 with iSkysoft Video Converter? - 3 Easy Steps! iSkysoft video converter for Windows converts video at 90X faster speed. It generally takes seconds to convert a video, but it depends on the video size. It needs 3 steps to finish the whole process, add video file - choose an output format - convert. Now let's see how to do it (Please make sure you have installed iSkysoft Video Converter Ultimate on your Windows 10). Open iSkysoft program on Windows 10. From the Convert tab, click Add Files to locate the video that you want to convert. Alternatively, you can drag and drop the video into the converter. Next, from the Convert files to option, choose the output format as needed. There are MP4, MOV, MKV, AVI, WMV, M4V, etc. Jsut choose the one you want. Batch conversion is supported, that means you can convert more than 1 videos at one time. Now click on the Convert button to let the converter start working. It will take few seconds to finish the job. After that you will get you video converted in desired format! That's it! Any Video Convertor 3.3.2 is perhaps the best free video converter for Windows 10 if you do not need any advance features installed. All you have to do is drag a video into the program and select the format in which you want to convert and then click "Convert Now"! Does not include many features. Free Studio 5.3.3 is another best video converting software on Windows 10 PC. It comes with 45 freeware tools that can help you with a number of tasks related to video conversion and editing. It is again easy to use since all you have to do is drag a video clip in, choose an output format and click convert. It has got a very beautiful interface and converts MP4 videos at a high speed. It has got slow FLV export. 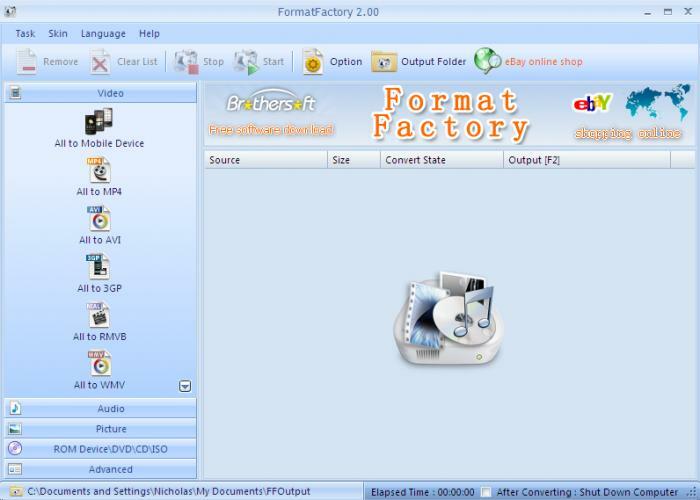 Format Factory 2.8 is one of the best video converters for Windows 10. You simply choose the file you want to create, add in the videos and select the output format and hit convert. There are a number of built-in conversion pre-sets. Does not contain many useful features. Freemake Video Convertor 3.0.1 is a very useful software as it contains a number of supported formats in which you can convert the videos to. You can also import YouTube videos and convert them as well. It supports a number of input formats. Output formats are quite limited. Supported Formats iSkysoft Video Converter Ultimate for Windows supports conversion of various formats. It allows users to convert files of different formats from/to various standard video/audio and HD video formats, including AVI, MP4, MOV, NUT, NSV, WebM, MKV, M2TS, TS, VOB, MPEG-2, MPEG-1, MP3, AIFF, WAV, and so on. Converting Speed This software converts files of various formats in a 90X faster conversion speed. It helps you save much of your time spent in format conversion. Ease to Use This iSkysoft Video Converter Ultimate allows various kinds of users to use the program easily. No special skills are required. Whether you are a beginner or an experienced user, you will find it easy enough. Additional Features If you need to edit your videos before converting them to other formats, you can do that with iSkysoft Video Converter Ultimate. You can also trim your videos freely.